Sheppy's Blog: BIAB for me? I'm having troubles finding a mesh bag large enough for my 8 gallon pot. Might have to make one. Unfortunately, we don't own a sewing machine, so I'm not sure how I'll be able to get it made. Probably not going to be able to get it made for this weekend's brew session. Bummer. Hello, I am thinking of going to all grain using the BIAB method. I seem to be hung up on the fact that my kettle only holds 8 gallons, when I do the math it sounds like to make a 5 gallong batch you will need 8 to 9 gallons of water when using the BIAB method. That will not fit in my kettle especially with all the grains. Obviously I will need to add water but am not sure at what point in the process to do so. How did BIAB work out for you using a 8 gallon kettle? I've now done 3 BIAB batches in my 8 gallon pot. Gringo Cerveza Jalapeño Cream Ale and Summer Lovin' American Wheat are both pretty low OG and worked out real well. Beer Smith did have me hold back 2.16 gallons and 1.87 gallons for sparge water. 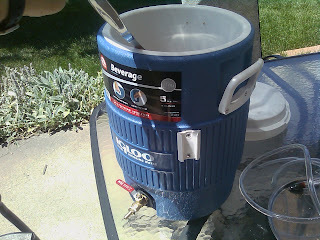 So, I did the mash with all the water except the sparge water and then "sparged" by putting the bag into a 5 gallon gott cooler with the rest of the water and steeping for 10 minutes or so. Quarter Life Crisis was the other beer I tried. OG = 1.072. I basically did the same thing. I mashed with as much water as would fit in the pot with the grains and then sparged with the rest. The amount of grain that was involved with the 1.072 OG, though, was difficult to work with. (see http://blog.ericshepard.com/2011/06/brew-day-quarter-life-crisis.html). 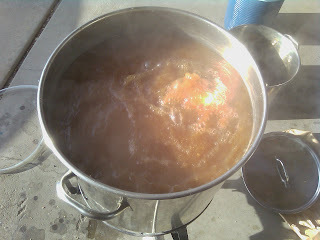 The beer turned out great with a decent mash efficiency, but I have decided to change my process. I have purchased a 10 gallon gott cooler. I'm going to BIAB inside this cooler. The extra volume should be enough for anything I'm likely to make PLUS it will be easier to maintain heat in the winter months. My first experience with the modified method will be this weekend. I'm sure I'll blog about it either Sunday or early next week. Home brewing beer will be tastier if you made it in the right way. Over practice you can master the art.